The first legitimate Freak Out Friday in nearly three months isn't even getting posted on a Friday. But I promised you guys I'd have something, so rather than waiting a week, here it is. Obviously I have to start with something that was printed in the Vancouver Sun around the time of the Canucks' third jersey release. 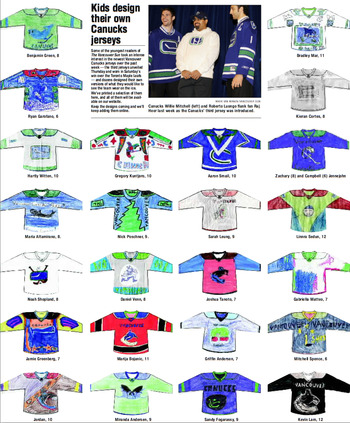 The newspaper asked kids to create an alternate jersey for their Canucks — and wait until you see them. I don't mean to make fun of the kids so much as those of you that like to belittle professional artwork that isn't to your particular taste by saying it looks like a 5-year-old made it. These were made by 8- and 10-year-olds. Yeah. But since we're on the subject, you guys like any of these for a future alternate or one-off sweater? Only got a few more items tonight. The Icethetics cup doesn't exactly runneth over in quality Freak Out art these days, despite the public outcry for it. 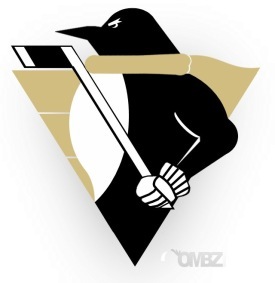 I like this one, particularly because I've always been a fan of that king head logo. As much as he may look like the creepy Burger King mascot, I just feel like it's the next best representation of a team called the Kings. Second obviously to a crown. That pretty much goes without saying. The fact that it's on a playing card — I'm surprised something like this hasn't shown up in my inbox sooner. But this is quality work nevertheless. I even think we could've gone with all the extra colors you see on an actual card. And throw a few suits in there for good measure. But let's move on. The Pittsburgh Penguins are the next topic of discussion. Sometimes a revamped logo works. Sometimes, well, I'm not one to make generalizations about the sexual preferences of penguins — but this one is so gay. He's got the little scarf, the small but toned muscular arms, puffed up chest and absurdly skinny waist. He's even got that look like he knows I'm talking about him and doesn't like it one bit. No disrespect to the designer or anything, of course. Just some random observations. The last two things I have for you are photographs. One you'll quickly notice is doctored to prove a point. The other you'll wish was. Ever get the feeling the Thrashers' third jersey looks out of place on the ice? Wonder where it belongs? Wonder no more. I've never seen that sweater look more at home. And finally, Sens fans, there may well be something you didn't know about Anton Volchenkov and Jason Spezza. I think Volchenkov's face pretty much says it all. And I'll leave you with that tonight. That visual. Try to sleep now, suckers.